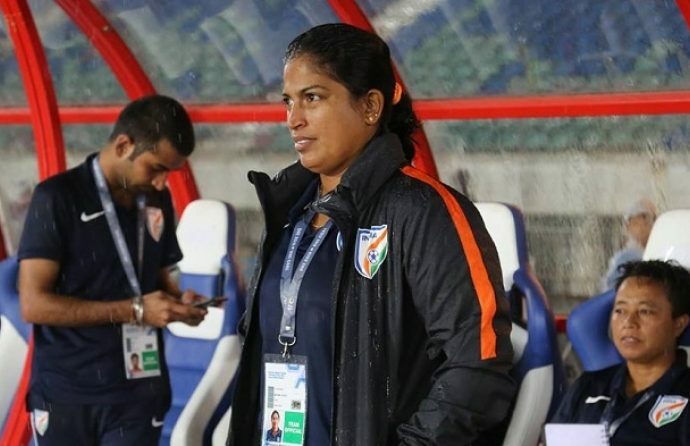 The Indian Women’s National team is all set to cross swords against continental rivals IR Iran, Myanmar and Nepal in the Hero Gold Cup which will be played at the Kalinga Stadium in Bhubaneswar from February 9-15, 2019. The girls are currently “high on confidence,” courtesy their four wins in their last 4 Friendlies against Hong Kong and Indonesia respectively. In an AIFF Media interview, Head Coach Maymol Rocky spoke at length about the team’s recent run of successful results, the significance of the forthcoming Hero Gold Cup, the “young India” and much more. The team had a great set of wins in Hong Kong and Indonesia. How do you look back at the performance? Any coach would be happy with four wins in a row! The games against those two nations were definitely a good experience for us. Both were good International teams. The confidence level among the players is high. We are all set to put our best foot forward in the Hero Gold Cup. Any players you feel who stood out in these recent matches? From the starting XI to the bench – every player has stepped up her game. I feel that as compared to the level we played at in Myanmar (2020 Olympic Qualifiers Round 1), all the players have made huge strides. Our bench strength has improved a lot as well. If I gave any of them even five minutes to play in a match, they would give it their all and do better than what they did last time. You have also kept clean sheets in your last three matches. What are your thoughts on that? I feel that while defending, it is the whole team that defends and while attacking, the whole unit attacks. As a coach, I am happy that we did not concede in our last three games and the credit goes to everyone – from the striker to the goalkeeper. How important do you think is the Hero Gold Cup for the team’s development? This is the first time ever that such a tournament is being organized in India. I feel it is a great opportunity for us to create heroes. The players will get to play in front of their home crowd and the spotlight will be on them. We can unearth some real gems at the Hero Gold Cup and show our fans what we are capable of. Secondly, this competition is the best platform the girls could get. The teams that have been invited are all of high quality. All of them have also qualified for the second round of the Olympic qualifiers. Playing them and the prospect of defeating them will keep us motivated and focused, and help us elevate our game. You mentioned earlier that the team is a very young side. Do you think it will be an advantage going into the future? I have always placed my belief in young players and I feel that they can really take you places. Most of our players are under-23. It’s a young India. So I can mould the team the way I want, and have them play the style of football I want them to. These youngsters have a good understanding of the game and are always willing to learn newer things. Which area do you feel the team has the most scope for improvement? My focus is on improving our finishing in front of goal. We have got better in recent times in converting our chances but there is still a lot we can do. I’m certain that it is a matter of time that things fall into place and we improve our scoring rate.